It is not just a player’s first roleplaying game which makes an impression, it is also their first adventure. For many of a certain age, this would be B2 Keep on the Borderlands, the introductory adventure which for many years appeared in the Basic Dungeons & Dragons boxed set. 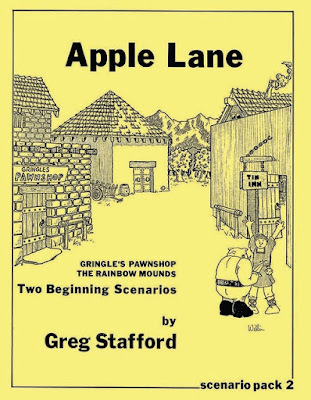 For others it would be Apple Lane, the scenario first published for RuneQuest in 1978 as Apple Lane: Two Beginning Scenarios - Gringle’s Pawnshop & The Rainbow Mounds (Scenario Pack 2). This would be revised as a second edition in 1980 and then again in 1987 by Avalon Hill for use with RuneQuest III. The second edition would be further revised again in 2016 for a PDF as part of the Kickstarter campaign for RuneQuest: Classic Edition and it is the second edition which had the most impact, having appeared in the Runequest, 2nd Edition Boxed Set—both the American and British editions—and so was not only the first scenario for RuneQuest that many played, but the first chance to play in the world of Glorantha. With the release of the RuneQuest - Gamemaster Screen Pack and its ‘Adventures Book’ set in and around Apple Lane, it seems as perfect a time as any to examine the original scenario. Apple Lane is set in the heart of Sartar, somewhere in the hills to the west of Jonstown on a minor, but busy trade route. At first sight, the hamlet looks to have too many facilities for its number of inhabitants—the Sheriff’s House, a temple to Uleria, a Weaponmasters Guild Hall, the Tin Inn, a Horsemasters Guild Hall, a Temple to all Deities, a Smithy and Armoury, and of course, Gringle’s Pawnshop. Yet if you consider that Apple Lane is on a trade route, that there are numerous surrounding farms, and that it is meeting point for the various clans and tribes—which explains why the player characters are in the village—and it makes more sense and it feels more natural. What comes across from the nicely detailed inhabitants is that Apple Lane is a quiet place, a sleepy little village where many of its inhabitants have retired and settled down to raise families after lives elsewhere or adventuring. Each is detailed enough and fully statted out—this is RuneQuest after all—for the Game Master to roleplay each of them. 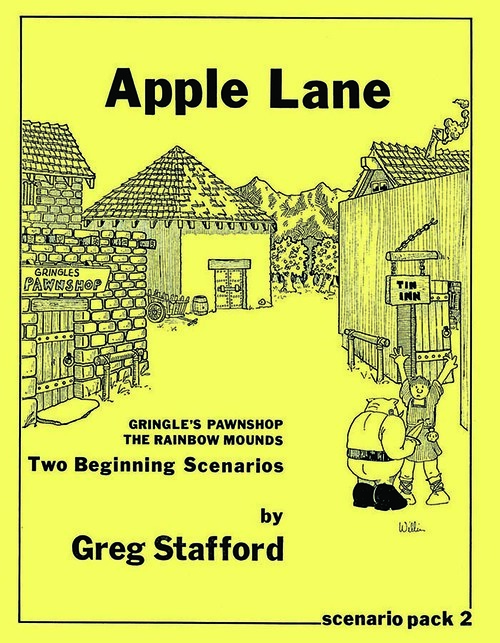 As its subtitle suggests, there are two scenarios in Apple Lane, ‘Gringle’s Pawnshop’ and ‘The Rainbow Mounds’, but there is also a set-up. This is ‘The Tribal Initiation’, primarily a primer for both Game Master and her players as to how combat works in RuneQuest and how deadly combat is. Simply, the player characters have to fight each other, not to kill each other, but to prove that they can defend themselves, be trusted with their weapons, and thus become proper adults. This is as much ceremony as it is a deadly lesson and to help enforce the feeling of ceremony and enforce the culture of the tribespeople, there being a piece of poetry given that should be read out after the initiation. ‘The Tribal Initiation’ is designed for new and beginning characters and this continues with both ‘Gringle’s Pawnshop’ and ‘The Rainbow Mounds’. As well as introducing the players and their characters to RuneQuest and its combat mechanics, ‘The Tribal Initiation’ also brings the player characters to the attention of Gringle, a Rune Lord-Priest of Issaries, a wily old coot who runs a pawnshop in Apple Lane. He has a slightly mysterious reputation—some actually think that he is a werewolf!—not helped by the fact that he disappears into his fortified premises once a month for a whole night. The events of ‘Gringle’s Pawnshop’ takes place on one of these nights, the night of the full moon and on this particular night, Gringle has a problem. Although there is a little roleplaying to be had with Gringle and some exploration of the inside of the pawnshop, in the main this is an extended combat encounter, one with a highly tactical element to it. In fact, the scenario lends itself to being run as a full tabletop encounter complete with miniatures and a map of Gringle’s Pawnshop. (Indeed back in 1986 when I ran this, it was with miniatures on a 25 mm scale plan of the building done on a sheet of A2 architect’s trace paper.) Some preparation is needed, certainly the players need their own copy of the floorplans to Gringle’s pawnshop and the Game Master will probably find it easier to have copies of all of the attackers to hand, but seperate to the Apple Lane book itself. Playing through ‘Gringle’s Pawnshop’ will probably take two sessions, perhaps one long one at the very least, but either way it will involve a lot of combat. Overall, ‘Gringle’s Pawnshop’ is a lot of fun, an intense introduction to the combat mechanics and the need for tactical thinking in combat as well as a little of the stranger elements of Glorantha. Apple Lane’s problem with attackers continues with the second scenario, ‘The Rainbow Mounds’. Bandits have been preying on the area and the Sheriff has determined that they are a bunch of Trolkin led by a Whiteye, a Dark Troll who recently returned to the area. For the most part, the inhabitants of the region get on reasonably well with trolls, but have offered a reward for Whiteye’s head and those of any bandits. The sheriff has also determined that the gang is hiding out in a cave system known as the Rainbow Mounds. At first, this seems like a simple raid on a cave system, but there is a bit more to it than that. Physically, Apple Lane is a plain and simple book. It is lightly illustrated in a cartoon style, including the cover. The writing is good and includes useful advice as to what the NPCs in both scenarios will do, whether attacking the player characters or responding to their actions. The maps though, are at best serviceable. Gringle’s Pawnship, for instance, is renowned for its architectural oddities, such as oddly long hallways. Of course, Apple Lane could still be run today and without any real adjustments—especially if the Game Master has a copy of RuneQuest: Classic Edition (or her original copies of the rulebook). Yet, the similarities between RuneQuest: Classic Edition and the recently released RuneQuest: Roleplaying in Glorantha mean a Game Master could easily run Apple Lane with very little adjustment. Now to get the most out of both ‘Gringle’s Pawnshop’ and ‘Rainbow Mounds’, the Game Master will need to have access to the RuneQuest - Glorantha Bestiary for details that her player characters will face and the RuneQuest - Gamemaster Screen Pack for background about Apple Lane, its surrounding area, and the three adventures given in the ‘Adventures Book’ which is included in RuneQuest - Gamemaster Screen Pack. The one issue here is that the events of Apple Lane take place several years before RuneQuest: Roleplaying in Glorantha is set. So the Game Master will need to adjust when she runs the two scenarios in Apple Lane, perhaps in a flashback prior to running the three adventures in the ‘Adventures Book’. It is easy to dismiss ‘Gringle’s Pawnshop’ as little more than an extended combat encounter and ‘The Rainbow Mounds’ as a dungeon done RuneQuest-style, but neither description is appropriate. Most obviously, both are populated by a cast of well drawn characters who all have their own motivations and fit the setting, even the ones who are barely competent. Both also possess elements which highlight aspects of both RuneQuest and Glorantha, whether that is the lethality of combat—showcased first in ‘The Tribal Initiation’ and then later on when NPCs are ready to surrender rather than fight to the death; in the importance of faith and ritual—again in ‘The Tribal Initiation’ and then with Gringle’s need to perform a ritual on the night of the attack; and then the mythic nature of Glorantha with the encounter with the Newtlings in ‘The Rainbow Mounds’. Together they mark the world and the fantasy of Glorantha as being different—definitely more different than the fantasy that was more readily available for the hobby when Apple Lane was first published in 1978, and still different today. Although it was not released as part of it, it is clear that Apple Lane: Two Beginning Scenarios - Gringle’s Pawnshop & The Rainbow Mounds (Scenario Pack 2) is better than anything in the The Old School RQ Source Pack—although SP8 The Sea Cave has the potential to come close. Sparse by modern standards, Apple Lane: Two Beginning Scenarios - Gringle’s Pawnshop & The Rainbow Mounds (Scenario Pack 2) was an excellent introduction to roleplaying in Glorantha in 1978 and like any good classic, it remains still very playable today.